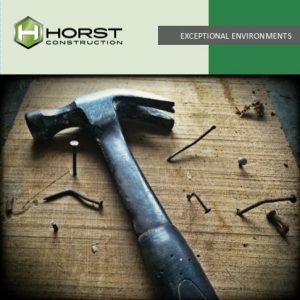 While we take a lot of pride in the work we self-perform, Horst Construction cannot complete a project without the help of our valued and qualified subcontractors. It is a reality of our industry that a construction project will only be as strong as the weakest link, and for that reason we are very particular in our choice of partners for each of our projects. One of the things that makes Horst different is that we have a thorough prequalification process that we utilize prior to signing up a subcontractor on any project. This process is something that the client can be as involved or as hands-off as they’d like to be. Many clients like to participate in the process because they can direct certain important qualities that are specific to their project. We also work with clients who have specific vendors or subcontractors that they would like to use, or who would like to use volunteer labor for portions of their project. The fact that we do not have a problem getting competent subcontractors to bid is because they know we have, and will, treat them fairly. Subcontractors like to work for Horst because our bid documents are clear, we invite them in for descoping meetings to review their bids, our jobs are organized in the field, and we are financially sound. All these factors work to reduce their risk, which reduces their contingency, and ultimately their pricing to us.